A summary of news stories published by Journey North. Estela visits El Rosario and Chincua sanctuaries immediately before the storm. Images show that mass departure for spring migration has not yet occurred. Estela documents the high winds, rain, sleet, and cold temperatures that struck the region. 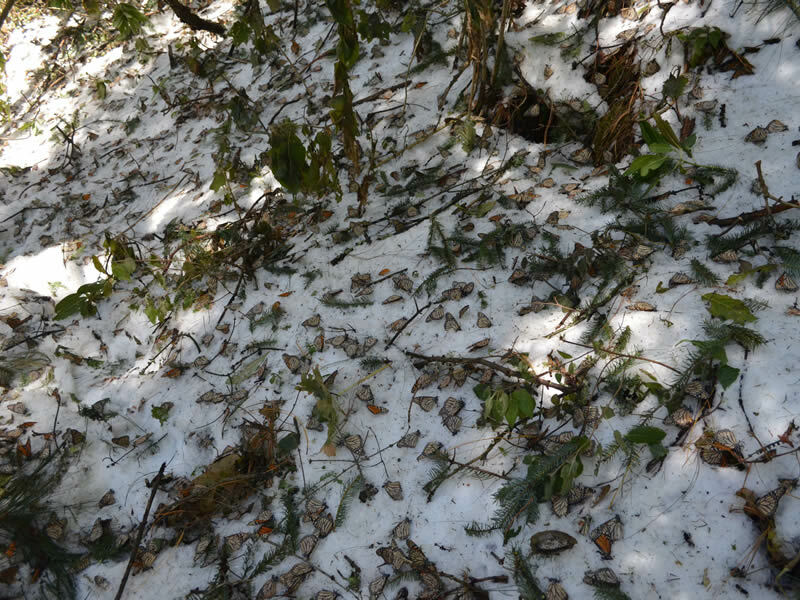 Photos from El Rosario Sanctuary show ice-coated butterflies and trees toppled by the strong winds. Ellen Sharp, who lives near Cerro Pelon and visits the sanctuary regularly, shares her concerns about the destruction she witnessed. 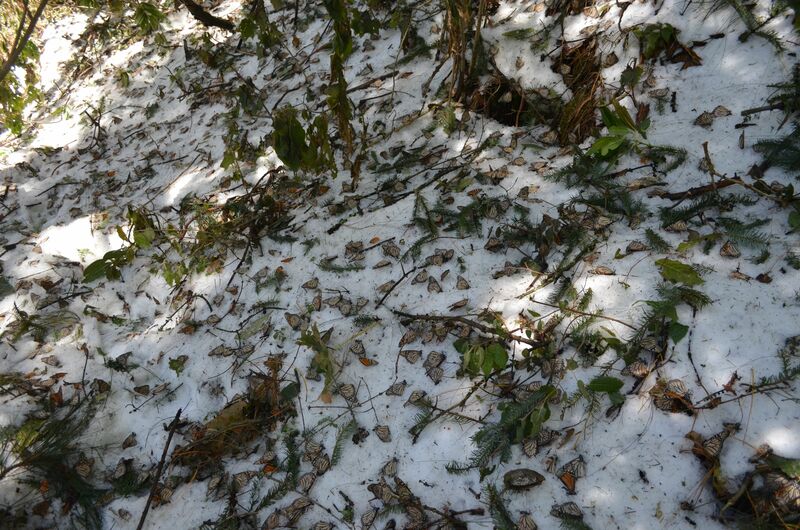 Estela visits snow-covered El Rosario Sanctuary and talks to sanctuary biologist, Felipe Martínez. Entrance is forbidden. 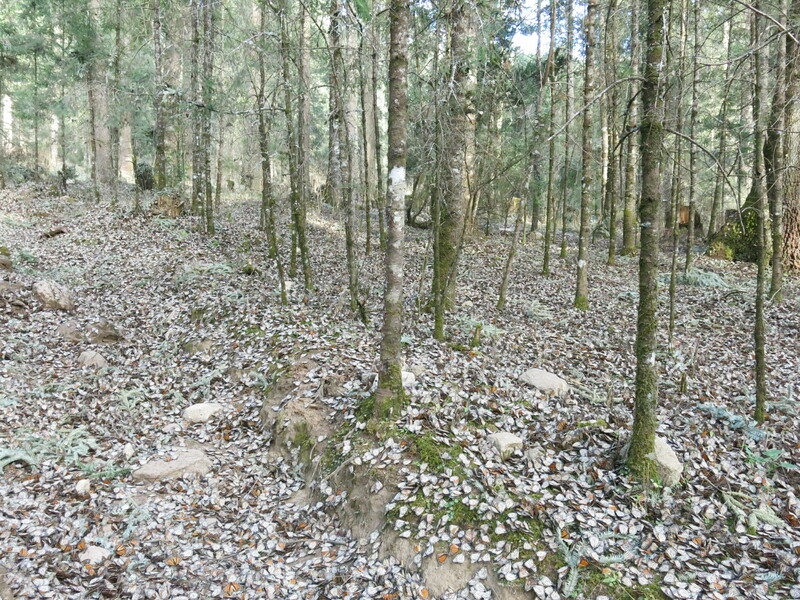 Estela enters El Rosario and finds extensive damage to forest habitat. Access to the core sanctuary to see butterflies is denied. 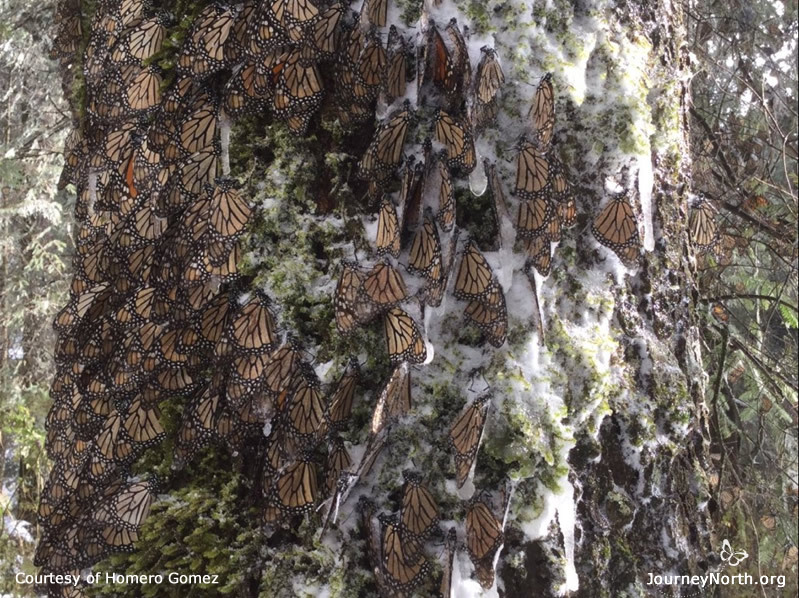 A summary of the key questions and concerns about butterfly mortality and habitat destruction. Estela's first visit into the core of the sanctuary after the storm. Dr. Lincoln Brower predicts a 50% loss of life for monarchs based on newly obtained temperature records. Estela joins the scientific team to collect mortality data from the devastating storm. 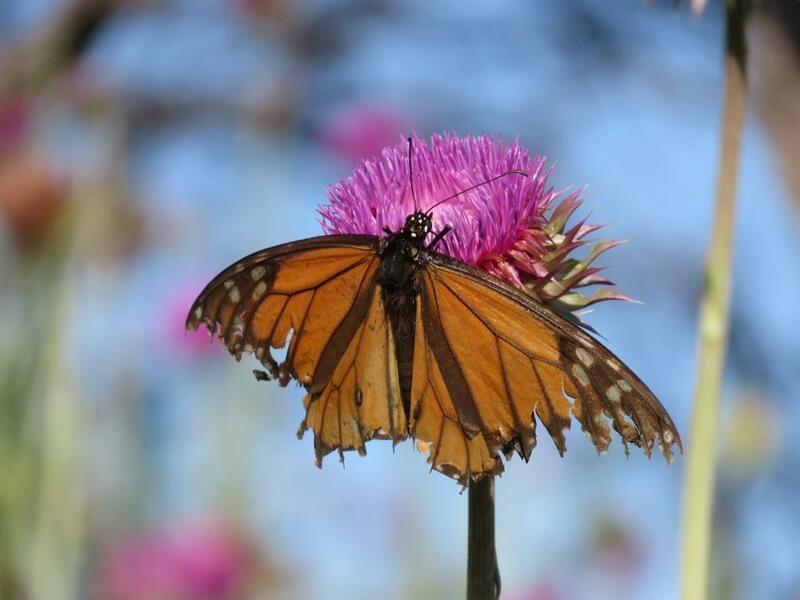 During spring migration in Texas, observers post photos of returning monarchs in poor condition. 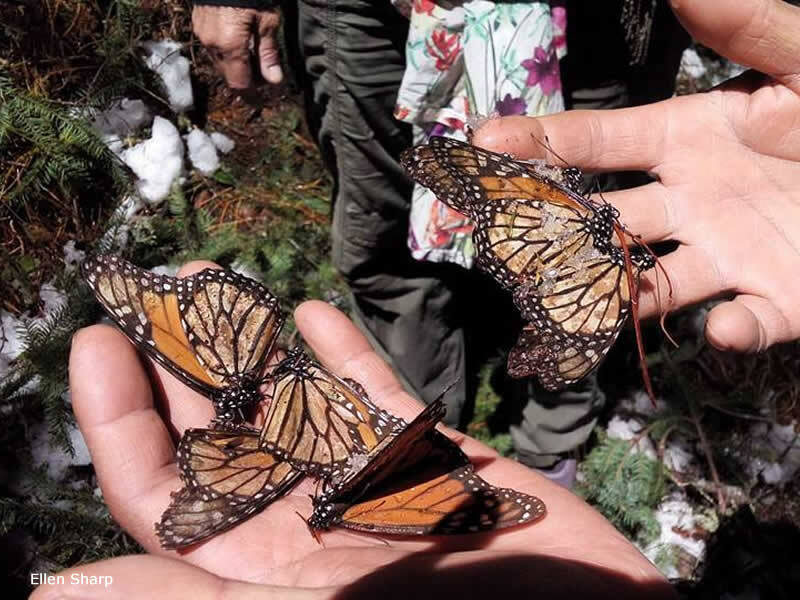 Presumably survivors of the March storm in Mexico, these tattered butterflies flew hundreds of miles to their breeding grounds.